Every month on the second Saturday. This is a gathering of Automotive Addicts of all types in one place. We regularly attract over 500 vehicles each month welcoming all makes and models of all years. Every month on the second Saturday. Bring your favorite car or hot rod, tuner, or streeter & join us for a friendly gathering of your buddies and FREE coffee and breakfast. Get your car questions (or problems) answered for FREE by Andreh & our 4 knowledgeable, experienced mechanics. Open to all years, makes and models. Every month on the second Saturday. Hosted by the BMW CCA Everglades Chapter. This is meet and great for all BMW owners. Every month on the second Saturday. We’re a group of various car groups. We like to get out and show off our cars. It is a plus when we get to see what the other guys and gals have. Every month on the second Saturday. This is a monthly gathering of over 300 car enthusiast that includes exotic, super, hyper, custom, classic, muscle, and vintage cars. The carefully curated auto collective approach of Supercar Saturdays Florida has the objective to create the ideal event which combines a casual and friendly approach that allows attending automotive fans to spectate and interact within the drivers will getting a close up of some of the rarest vehicles. Food, entertainment and more. Spectators are free. April 13th is the 3 year anniversary, as part of the celebration, we will be previewing the Vision Jet from Cirrus Aircraft. The Fuel Run Rally will be passing through, along with over 500 exotic cars, and hundreds of spectators. Every month on the second Saturday. Over 200 cars and trucks parked along the oak shaded brick streets every second Saturday of each month. Music by DJ Don from Cruisin Orlando. Free for all years and models. Hosted by the City of Longwood. Every month on the second Saturday. 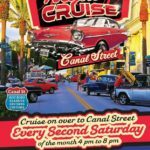 Hosted by the Cruisin’ Couples Car Club and the Leesburg Partnership, and held on Main Street in Historic Downtown. Cash drawing, trophies, food trucks, entertainment, shopping and a movie shown on the big screen. Every month on the second Saturday. Hosted by the City of Auburndale, 50/50, cash door prizes, Chinese auction DJ and restaurants within walking distance. Every month on the second Saturday. Hosted and music by Lance’s Cruzin to the Hop. Great food and a big parking lot. Trophies, prizes and lots of FUN!! Try it you’ll like it!! Every month on the second Saturday. All makes and models welcome. Featuring Cruiser of the Month awards, 50/50, great door prizes and music by our own cruise master. Food discounts for all participants. Come out and meet some old friends and create some new ones. Hosted by the Mid Florida Mustang Club (MFMC).